It is not only very helpful to learn about informal logical fallacies, but can be fun. At least, they are for me. Not only does this help you in discussions so you can see if some owlhoot is building an argument with faulty reasoning, but helps you check your own arguments so you can present present them as accurately as possible. The more I learn about fallacies, the more I see that not only can many of them get combined and overlap (a comment can a contain complex question, an ad hominem and a genetic fallacy all at the same time, for example). Are you afraid to back up your claims, or just too stupid to cite something from a real source and not from creatard sites? More than that, I keep seeing additional "fallacies" that appear to be simply made up. Someone accused me of committing a fallacy because I pointed out his own fallacies, therefore, I was negated and he was free to build his faulty arguments! Now, I can see that if someone makes false accusations about a fallacy, that is a valid complaint. But the example I gave, and others, I am suspicious that they're valid. Or at least, I reckon they're not established or important enough to list with more important fallacies. Since you're not proving anything, I guess you're not able to understand logic. So, I'm going to make up a fallacy of my own: The "Prove It Fallacy". Although it can happen in the real world, it occurs much more frequently on the Web. There have been times when I have made comments that people enthusiastically attacked and demanded proof. I could say, "I remember reading that John Wayne left the comfort of his film crew camp and brought food to the Mexican extras at their camp, and ate with them". Someone might reply, "Citation, or it never happened". Yes, there are people who demand proof for what seems like almost everything you say. I really think that the Atheist Handbook™ forbids allowing Christians (especially creationists) to be right, so if they can't get every challenge answered, they use the argument from silence and consider their opponent to be refuted. (This is similar to "typo pouncing", where a simple mispeling is used to negate an entire discussion, or even the personhood of the commenter.) Such tactics make it very difficult to have a decent exchange on the interweb. The more I cognate on this, I'm seeing that it may be just a subfallacy of an important, established fallacy: the red herring. It's just a means of distracting from the topic at hand, and avoiding whether or not someone has a decent argument or response. When you think about it, old son, you'll see that many fallacies have a measure of red herring in them: Ridicule, poisoning the well, appeal to motive, libeling someone by calling him or her a liar without evidence (making the accuser the liar), straw man and more (you can see a corral-load of fallacies in my "Logic Lessons" series). Now, sometimes distractions and rabbit trails can be fun, but also frustrating for people who want a discussion to stay on track. 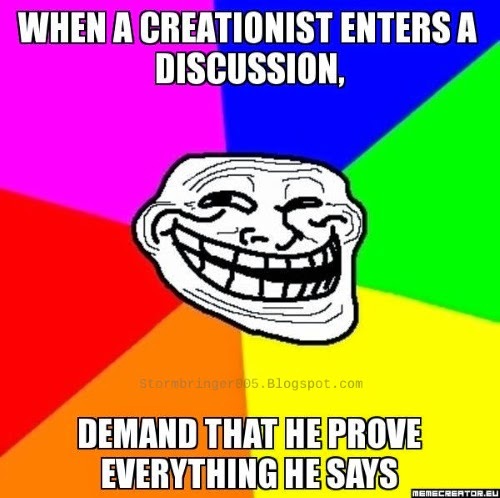 Of course, there are times when someone makes a claim that is relevant to the discussion and needs support (especially when someone makes a claim as an attempted rebuttal to someone's comment, such as, "You creationists are all liars!" — back that up, Skippy). That's not my point here. I'm talking about those sidewinders who challenge so many statements that they ruin the discussion. (On a side note, there have been times where I was asked to support my claims, so I gave them a link to one of my articles. They used the genetic fallacy and rejected it out of hand because it was my work, and didn't bother to see that I documented what I had to say seven ways from sundown.) Ofttimes, they won't even bother with the support you wasted time in tracking down and posting because they're just interested in being obstreperous. The issuing of constant challenges indicates to me that someone isn't interested in having a rational discussion. I believe that anti-creationists and atheopaths are unwilling (and maybe even afraid) to consider reasoned arguments from Christians (especially biblical creationists). Are these people challenging you for the sake of challenging? That's up to you to decide, and to choose whether or not you're simply wasting your time.